West Palm Beach, FL [November 17, 2014] – ArtPalmBeach will commence its 18th edition at the Palm Beach County Convention Center from January 22 - 25, 2015, with an opening night preview on January 21st. 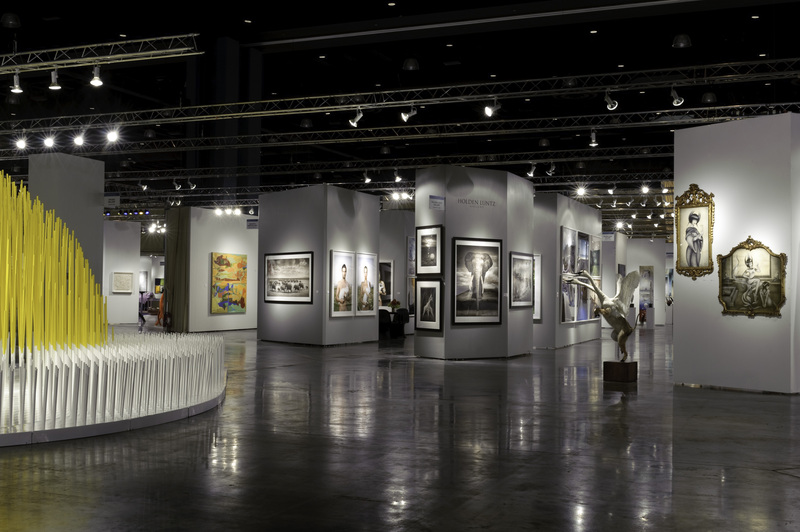 Founded by Lee Ann and David Lester in West Palm Beach in 1997, ArtPalmBeach is considered Florida’s most influential winter contemporary and modern art fair. This year over 85 international galleries and partnering institutions are expected to exhibit leading works by contemporary and emerging artists. ArtPalmBeach will continue its commitment to introducing new galleries with international art exhibitions to the Palm Beach fair under the 2015 theme Going Global, which will focus on galleries from Asia, Latin America, and Europe. Confirmed new galleries to date are Adler Subhashok Gallery, Thailand; Callegari Fine Arts, Brazil; Cordeiros Galeria, Portugal; Galerie Bruno Massa, France; Galerie Magenta Projects, Belgium; K Plus Y Gallery, France; Galerie Lausberg, Düsseldorf; Poczesna Galeria, Poland; Pashmin Art Gallery, Germany; MA2, Japan; and Galeria ArtLabbe, Chile. The Korean Art Pavilion will continue to expand this year with galleries from South Korea and international galleries specializing in Korean artists from London, New York and Basel, Switzerland. ArtPalmBeach is also pleased to present a wide array of daily lectures, artist panel discussions, book reviews and art video screenings throughout the run of the fair. Programming highlights will include a performance by Beatriz Millar titled PLASTIC DORIANNE IN LOVE, sponsored by WhiteSpace Contemporary Art of West Palm Beach. Panel discussions will include: Kinetic International Art Biennale and Boynton Beach Art in Public Places; Aperture Foundation; and gallerist, Dr. Thomas Riley. Highlighted video screenings are Ai Weiwei and Bert Benally’s 2014 film Pull of the Moon, an immersive digital film project sponsored by the New Mexico Arts & Culture Experimental Dome Program, and a pre-screening of Pilchuck: A Dance with Fire, a PBS special set to air in the Spring of 2015 exploring the history of the institution at the center of the American Art Glass movement. Lecturers will include Dr. Irvin Lippman, the Executive Director of the Boca Raton Museum of Art who will explore the Surrealists’ interest in magic and spirituality; and Jean-Pierre Laffont, international photojournalist will give a talk sponsored by FotoFusion on his new book Photographer’s Paradise: Turbulent America 1960-1990. Music Biz will present its prestigious Independent Spirit Award to John T. Kunz, Owner and President of Austin’s iconic independent record store Waterloo Records & Video Inc. and an over 40-year music industry veteran, on May 13 at Music Biz 2015 in Nashville. The Independent Spirit Award was established in 2009 to recognize significant contributions to the independent music community that embody the spirit of new thinking, entrepreneurship, and success in the industry. Kunz’s customer-friendly policies, including the ability to open and listen to any record before buying and to return albums for any reason within 10 days, have led to a successful four-decade-plus career in the music retail industry, including over 30 years with Waterloo. Established in 1982, the store has been named Best Record Store for 32 consecutive years in the Austin Chronicle Readers’ Poll. It was also voted Retailer of the Year six times by Music Biz (then-NARM) members and has been featured in Best Record Store lists from Rolling Stone, NPR, The New York Times, The Economist, Vanity Fair, the BBC, Spin, and more. Registration for Music Biz 2015 is now open. ROCKIT BAR & GRILL IS GETTING REDESIGNED! After 10 successful years as one of the iconic pioneers of the vibrant River North neighborhood, Rockit Bar & Grill is going back to its roots with a complete re-design that will once again cut against the grain and reveal a design that combines the past and future in an unprecedented way. Scheduled to debut Spring 2015, 11 years after its original opening, Billy Dec, Brad Young and Arturo Gomez are poised to revolutionize River North once again. Read more about our design and re-launch plans by clicking here. Looking to join the team? We're hiring. Click here for a list of current openings! November is upon us and with it the holiday season, so we want to be the first to wish you a very Happy Thanksgiving! The Conservation Center's open house last Friday, November 14, attracted more than 150 guests, including our advisory board members, clients, and friends from all over. We are always grateful for your genuine support, so thanks to everyone who braved the cold and came out for a visit. This month, we are highlighting two projects with rich stories: one is the conservation of a massive 18th century, Spanish colonial frame that involved cross-departmental teamwork; another involves refreshing a handsome portrait of legendary heavyweight champion, Gene Tunney. Also, our latest Vimeo video takes you into our frame conservation studio and offers a glimpse of the labor-intensive process of hand-sculpting frame decorations. Our staff at The Conservation Center is always up for a good challenge, so when an elaborate frame surrounding a 17th-century Spanish Colonial painting came to us for repairs recently, we rallied not one, but two conservators from different departments to collaborate on this project. Towering at 6 feet tall by 9 ½ feet wide, the sheer size of this frame is impressive enough before even considering the stunning craftsmanship and details worked into the edges and corners. The Center's Senior Gilder and Frames Conservator teamed up with our Senior Furniture Conservator and worked their magic on this amazing frame. "Boxing is what you did, not what you are." That's what Nobel Prize-winning author George Bernard Shaw (1856-1950) once said to the legendary heavyweight champion, Gene Tunney (1897-1978). Gene Tunney was recently introduced to The Conservation Center by way of his son, Jay Tunney, when he brought in a beautiful portrait of his father painted by Irish artist Sir John Lavery (1856-1941) in 1928. While Gene Tunney's heart was in boxing--a fighter Muhammad Ali called "the greatest of the old-timers"--the painting does not depict what you would traditionally expect to see in a portrait of a tough, prominent athlete. bring your fine art or heirloom pieces to The Conservation Center on the first Friday of December and receive two-for-one assessment (normally $65 per item). For an appointment, contact Carly Lillwitz: 312.944.5401 or carly.l@theconservationcenter.com. Downsize Fitness, an all-encompassing health and wellness organization providing a transformational program to help members lose 50+ pounds through fully integrated physical fitness, is launching a new workout program, Downsize @ Home. Downsize Fitness has locations in Texas, Illinois and Ottawa, Canada, but wants to provide health services for those who don’t have access to the Downsize Fitness facilities by bringing the workout online, to benefit members all over the world. Downsize @ Home is a truly unique service, providing members with live-stream, instructional workout videos available online. Each workout created by Downsize Fitness’s team has been modified to ensure that anyone can participate, whether at home or in the gym. Each time a member clicks play on a Downsize @ Home video; they are coached through specialized workouts personalized to work for any fitness level. Each workout also provides explanations on how each exercise works the body, so members know the benefits of this impressive program. Downsize Fitness was designed for individuals who are significantly overweight, and works to ensure that members lose 50+ pounds through fully customized physical fitness and personal training to fit the individual’s fitness level, an 18-month nutrition program and weight loss counseling. These three aspects foster a supportive environment where significantly overweight individuals can feel safe, without fear of shame or seclusion. One of the most inspiring aspects of Downsize Fitness is 95 percent of the staff have personally experienced weight loss transformation, including the company’s leaders. As a member of Downsize @ Home, the Downsize Fitness community becomes a personal support system, providing advice and encouragement for each individual via email. Downsize Fitness members are given support by mentors who know the hardships of serious obesity and continually work towards a healthier lifestyle. Downsize Fitness, Chicago, IL, is a fully integrated wellness program for weight loss, offering specialized fitness, customized nutrition programs and weight loss coaching to ensure customers weight loss success. Driven by employees and leaders who have experienced the same weight loss and health transformation’s, Downsize Fitness creates an environment that is rich with encouragement. With locations in Illinois, Texas and Canada, Downsize Fitness is poised for rapid expansion, combining a proven business model and unique concept with an unflinching commitment to supporting its growing franchise family, along with their customers. Pop-In@Nordstrom: Gift&Go will take you from found it, got it, gave it faster than you can say Happy Holidays! Naughty, nice – neither? Don’t answer that. Launching for the holiday hustle on Friday, November 21st, Pop-In@Nordstrom: Gift&Go has sleigh loads of ideas to cover your whole list. Pick it up in-store at one of our eight Pop-In@Nordstrom locations and we’ll even make sure it’s wrapped and ready – now tell me that won’t help keep your holidays merry and bright! From the outside, the shop is designed to look like one giant opened box, with tops and bows strewn around the outside. Wrapping paper designs are incorporated throughout the shop, and since every item in-store comes pre-wrapped, stacks and stacks of gifts in alternating patterns can be found throughout. Olivia Kim, Nordstrom Director of Creative Projects, partnered with Rafael de Cárdenas of Rafael de Cárdenas//Architecture At Large on the shop design for Gift&Go as well as five custom wrapping paper designs that take inspiration from traditional holiday shapes. How about a drone for the dad who has everything? Or sheets from Snurk that bring to life dreams of being a ballerina, firefighter, or astronaut for the niece or nephew on your list? Not sure what to get your little brother’s new girlfriend? Might we suggest the cutest bobby pins you’ve ever seen from Jane Tran (or so says Olivia Kim). While you’re at it, might as well add a few things to your wish list too – an exclusive swimsuit design from Lisa Marie Fernandez is perfect for that mid-winter getaway, and exclusive Topshop PJ’s are made for sipping eggnog by the fire. For the ‘it’’ girl in your life, handmade harnesses and handbags from Zana Bayne (as seen on Cara Delevingne, Debbie Harry and Madonna) are the ultimate cool-girl accessory. If you find yourself on Olivia’s list, you might end up with a June by netatmo bracelet that will measure your exposure to the sun throughout the day, letting you know when it’s time to reapply sun protection. Also among her favorites is the Little Cloud Lamp, a functional art object by L.A. based artist collective FriendsWithYou, emoticon jewelry from Alison Lou (as seen on Olivia in Elle Magazine), and notebooks from Graphic Image with customized sayings such as “talk is cheap” and “light my fire.” Gift&Go also features exclusive items such as Bamford x Rolex watches (in different colors of the rainbow), Clare Vivier clutches, stockings from Faribault Woolen Mill Co., a custom-lined Perfecto leather jacket from Schott N.Y.C., and a holiday tote gift set from Dean & Deluca with tins full of goodies. Your stockings might be hung with care, but if they are looking a little empty, we’ve got a solution: Q&Q solar-powered watches, Everyday Design Snowballs made in Finland that are convincingly real (there is even the small sound of a crunch), and the Polaroid CubeTM HD lifestyle action video camera are all suited for a sock. For the first time, Nordstrom created an interactive online video game, where you can help a virtual Olivia bag up gifts as they fall from the sky. Visit the Pop-In@Nordstrom website at Nordstrom.com/Pop to play. While you’re there, enter our Ultimate Gift&Go Giveaway to win the ultimate present – a 2015 1957 FIAT 500. Yes, we are seriously giving away a car. Launched in October 2013, Pop-In@Nordstrom is an ongoing series of themed pop-up shops that transitions every four-to-five weeks to offer a new shopping experience and batch of exclusive merchandise. Pop-In@Nordstrom is the brainchild of Olivia Kim, the Director of Creative Projects at Nordstrom, who hand-picks merchandise spanning the high/low price range to match each new theme. Items featured in past Pop-In@Nordstrom shops have included home and gift items from legendary Paris-based retailer Merci (their U.S. debut), a custom black-on-black Rolex by Bamford, a private astrology reading by The Astro Twins, apparel from rapper Drake’s October’s Very Own (OVO) label, a Bob Hurley surfboard with painted graphics from famed artist and surfboard designer Craig Stecyk III, design-driven wares from Los Angeles based Poketo, the exclusive launch of FEED Projects first-ever leather bags, the Heritage Collection, and the U.S. debut of Hong Kong fashion collective I.T.